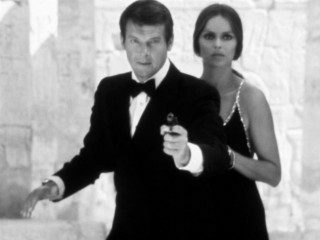 The Spy Who Loved Me was the third movie to star Roger Moore as James Bond, with Barbara Bach co-staring as KGB Major Anya Amasova. It is often described as one of the best spy movies ever made. When British and Soviet submarines are stolen, Bond and his female Soviet counterpart must work together to prevent a megalomaniac and his indestructible henchman using the submarines’ nuclear missiles to provoke world war three. It’s the 1970s. A British submarine is on patrol when it loses power and then disappears. The Royal Navy call in MI6 to investigate and MI6 recall James Bond from a mission in Austria. As Bond returns from a cabin in the mountains, KGB operatives ambush him. He kills one of them before escaping. In Moscow, the KGB learn that a Soviet submarine is also missing and assign Major Anya Amasova to investigate. The head of the KGB also tells her that someone from MI6 has killed her lover in Austria. 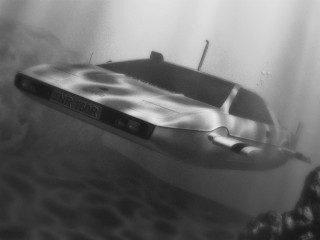 MI6 discovers that the plans for a submarine tracking system are being offered for sale in Egypt and suspect the system must have played a role in the disappearance of their submarine. Bond travels to Cairo, where he meets Anya, who is also looking for the microfilmed plans. 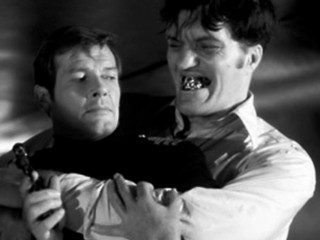 Before Bond and Anya can retrieve the microfilm, ‘Jaws’, a giant assassin with steel teeth, kills the man who’s selling the plans. Bond and Anya follow Jaws to a temple in the desert where after a fight they retrieve the plans. Anya then tricks Bond and escapes with the microfilm. The next day, the KGB and MI6 agree to work together to trace the missing submarines and Anya and Bond meet again. In one corner of the microfilm, Bond spots the logo of a shipping tycoon, Karl Stromberg. Bond and Anya travel by train to Stromberg’s base off the coast of Sardinia. On the train, Jaws tries to kill them again but Bond manages to kick him out of the train window. Jaws, seemingly indestructible, dusts himself off. Bond and Anya pose as a marine biologist and his wife to visit Stromberg’s base. While Bond talks to Stromberg, Anya discovers that his largest supertanker is suspicious. As they leave, Stromberg orders Jaws to kill them both. After a car, helicopter and submarine fight, Bond and Anya confirm that Stromberg is operating the submarine tracking system. While recuperating from the fight, Anya discovers that Bond killed her KGB lover. She tells him that after their joint mission ends she will kill him in revenge. The Spy Who Loved Me has a Mission plot (see spy movie plots). Involves one or more Allies in their Mission (Optionally, there is a romance sub-plot with one of the Allies). Attempts to carry out the Mission, dealing with further Allies and Enemies as they meet them. Narrowly avoids capture by the Antagonist (or is captured and escapes). The movie of The Spy Who Loves Me literally has nothing in common with the original novel by Ian Fleming, other than the title and the Bond character. This is partly because Ian Fleming regarded the novel as a failure and explicitly forbid its use as source for a movie. Although The Spy Who Loved Me is an enjoyable movie, it was made in the nineteen seventies, has dated somewhat and has faults, some a more forgiveable than others – the movie can’t really be blamed where film-making technology has improved. The locations and sets are great: the gigantic supertanker set, Stromberg’s underwater base, the Egyptian pyramids and temples. But movies have better cinematography now, and a lot of the sets, the train, the submarine, various hotels and clubs, seem overlit and stagey. The fight scenes are tame by modern standards, but that has its good and bad side: real fights aren’t the ‘ballet with fists’ we see today, and real punches don’t make a noise like an iron bar hitting concrete. And Bond actually looks scared when Jaws is beating the crap out of him, which is good. The action set pieces and stunt work in The Spy Who Loved Me are some of the best in any Bond film. Iconic moments like Bond skiing off a cliff and then his parachute opening, the Lotus Esprit turning into a submarine, and the bows of the supertanker opening to swallow the submarine, are great and work perfectly. On the other hand, special effects to include the actors in the action scenes have come a long way. Some of the back-projection used to include close-ups of Roger Moore in the action scenes looks poor now. Less acceptable is the script which is clunky, both in dialogue and plot mechanics, with a lot of brief logistical and plot exposition scenes. It also has Bond spout endless one liners, hardly any of which are actually funny. Scenes like Bond in Arab dress on a camel for no good reason are just an embarrassment. Also, by modern standards, the movie is quite slow – the opening half an hour in Egypt would be cut to about ten minutes these days – compare the pyramids scene in The Spy Who Loved Me to the similar scene at the opera in Quantum of Solace for example. The acting is mediocre all round. Roger Moore is okay when he’s not leering or smirking, which is not often. His occasional serious scenes such as when he explains to Anya why he killed her lover are good, but there’s not many of them. Barbara Bach is beautiful, but wooden, and considering she’s supposed to be the KGB’s top agent she doesn’t get much to do. Having said all that, The Spy Who Loved Me does still work, and I can forgive it a lot for the sight of Bond’s union jack parachute and the Lotus Esprit turning into a submarine. The best of the Roger Moore James Bond movies and the apotheosis of the over-the-top spy romp. The Spy Who Loved Me is available on Amazon US here and Amazon UK here . In the UK I recommend Amazon: A Kill in the Morning on Amazon UK, although the novel is also available in bookshops. In the USA, you can get the novel at A Kill in the Morning on Amazon USA. In India you can get the Kindle version at A Kill in the Morning on Amazon India. If you’d like to discuss anything in my The Spy Who Loved Me review, please email me. Otherwise, please feel free to share it using the buttons below.